Today we woke up and headed down for a classic Aston breakfast, it’s so nice to be back in this fancy hotel. My tastes have been gentrified with age I believe and I’m dragging my dad along with me. I spent the morning catching up on my emails now that I have proper wifi, writing up some stuff and bemoaning the state of my laptop. We went up the street for Juma’ and I was pleasantly surprised by the air con at the mosque. Afterwards we had a look in a few shops looking for some nice sarongs and headed back to the hotel. Anggi came and picked us up around 2 and took us out to some shops selling silk sarongs and material. We picked up a couple of presents and went for a coffee and pisang goreng a few blocks away. We dropped by Anggi’s house and checked out her little art supplies store, it’s basically a glass counter out the front of her house where artists drop in to buy canvas, paints, mediums, brushes and a few other materials. The street was great, pretty much a clean swept footpath with potplants on either side and rows of little apartments facing each other. You’d never think that there was a quiet little street of houses tucked in between the roaring traffic on either end. Her mum was great, she was plump and smiley, handing out biscuits and lemonade. We had a look at some of Anggi’s paintings, it turns out that she’s not a bad painter at all. Afterwards we headed up to Fort Rotterdam to visit some of her friends who have studios there. The first was a tiny little basement no more than 5 foot at the ceiling, there was bunch of young guys smoking and sitting around in there. The second studio we visited was entered through a tiny arched door about 4 foot high. It was much bigger inside, three barrel vaulted rooms full of historical paintings of Opu Somba and Fort Rotterdam. 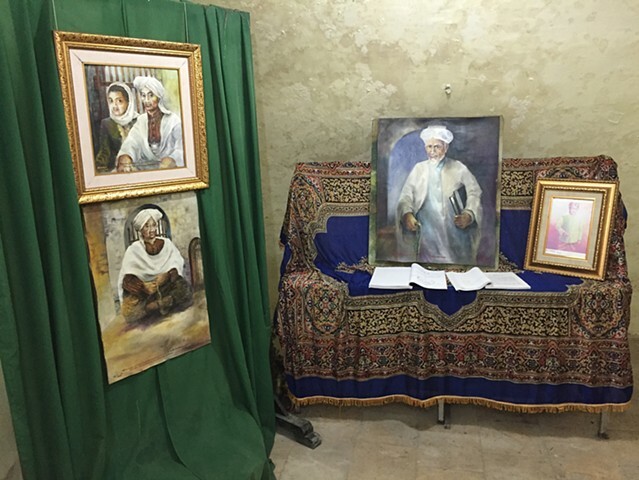 As we went through the paintings became portraits of historical figures and in the final room a series of important Islamic figures in South Sulawesi history. We met the artist Bachtiar Hafid (La Batti) and it turns out that he is a mystical painter and the figures in his works are arrived at through a process of Zikhir while he paints, going into a state of trance and meeting figures of the past in visions. Some of the figures included a Papuan, Toraja woman and several unnamed Europeans from the past who were executed in Fort Rotterdam. He was speaking very rapid and colloquial Indonesian and dad was translating what he could to me as he went. It was amazing to get a bit of an insight into the role that religion and history play in his process, something entirely outside of art for arts sake. That night we waited for Indra t come and pick us up from the hotel, he sent an email at 6.40pm and didn’t arrive for another two hours, dad and I had given up on him and went downstairs to get some dinner. There was a fantastic buffet and just when we sat down to eat I got an email saying that he was downstairs. We ate our dinner and went down to see him, the whole family was there and very apologetic for the delay, dad had to be up at 4am so it was a bit tight. We went out to their house and looked at Abdul-Aziz’s crazy pen drawings, he’s a damn good painter as well. We ate pisang goreng and drank sarabba with Indras family, checked out some of his videos and headed back to the hotel by 11.30pm. Both of us went straight to sleep. Thank you Sulawesi Selatan, it was a fantastic visit. History is all around but it’s hard to get a grip on it, things slip past and my lack of bahasa held me back a lot. Makassar has changed beyond recognition from when dad was there, let alone the stories of the past glory, kingdoms and colonial wars that I’ve read so much about. The people are the same, the mosques are the same, the kampung’s are the same and the things that happened here are the same but there is a stretch of imagination that must cross choking traffic, rubbish piles and gleaming new hotels. That’s where I’ll step in and see what my hands can contribute.